Posted by Jonny Greenwood on 11/28/2018 4:16:22 PM. EPUB is the most popular e-book format at present. But there are still many e-books which are not EPUB format such as MOBI, PRC, etc. So we need to convert these e-books to EPUB. Online conversion is a good choice as it's simple and easy to learn. What's more, it's free. There are so many websites for converting e-book to EPUB that you may be confused of selecting the best one. If you choose an unreliable website, you may need to wait for a long time conversion, or just get a converted EPUB file of low quality. But this will never happen if you read this article. 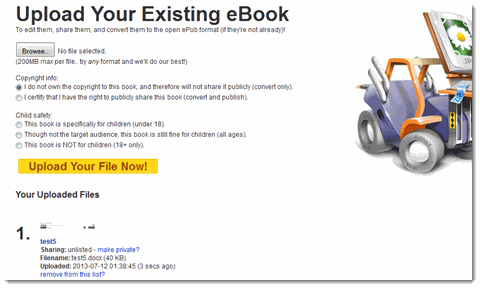 In this article, I'll introduce you 5 online EPUB converters and list their main features. I've tried all these online converters below so I hope my experience could help you. The free online eBook converter program is Epubor's new adventure, the whole team was working on it quietly and secretly for almost 6 months. With the screenshot image above I can say this online conversion app is in the top class among all the similar websites from design to capability. 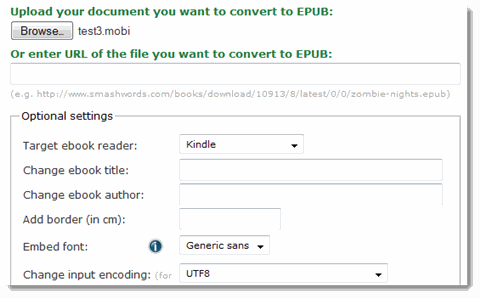 Now, Epubor also have launched a free online Kindle DRM Removal which can help us deal with DRMed AZW3 files synced from Kindle eReader device. Compare to most of online file conversion websites featureless UI design, this one stands out without little trouble. It supports batch conversion and it's very easy to use. Once you drag your files to the interface, it will convert format automatically for you. No need to click any "Convert" button. And the most significant advantage of this online eBook converter is that you can't even see any single advertisement on it. It's just pure, gorgeous and capable. ZAMZAR is a strong online EPUB converter. It supports converting mainstream formats to EPUB. The batch mode let you convert one more files a time. You can also enter a URL to convert online file. ZAMZAR doesn't support custom option. All you can do is uploading files and clicking the convert button. But this makes it easier to operate. One visible drawback of ZAMZAR is that you can't download the EPUB files when conversion finishes. Instead ZAMZAR send you an email and you have to click the link in the mail to download EPUB file. The online convert is based on Gutenberg Project, a famous volunteer effort to encourage the creation and distribution of eBooks. This online converter provides some custom options to let you modify the layout, font, encoding. You can also set your target e-book reader so that the output EPUB file will suit the device best. It supports converting mainstream formats like PDF and MOBI. You can upload your files from local or enter a URL. Online convert doesn't have a batch mode. You can only convert one file a time. The download link will pop up when the conversion completes. The interface of 2EPUB is very concise. 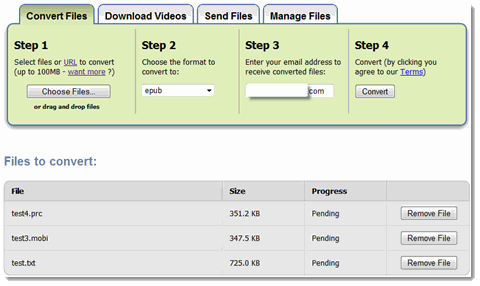 All you need to do are just three steps: Select files, upload files and convert them. 2EPUB supports many formats and batch conversion. You can save the EPUB file or download the result in zipped format. 2EPUB only supports 25MB file size as maximum. So it's more suitable for small file conversion. The Go4Convert has no limitation of file size. This is its most important feature. In addition, it's very fast - perhaps the Go4Convert is the fastest online EPUB converter I've ever used. It uploads faster, converts faster, and operates easier –just select a file and the converter will do the rest. No extra clicking or setting. Just convert in one-click! The output file of Go4Convert has smaller size than other online converters and it's not specialized for some device. In other words, it doesn't have a very high quality. EPUB Bud supports many mainstream formats and a 200MB file size as maximum. It allows you set the copy right info and child safety. If you want to convert an EPUB e-book for your children, EPUB Bud may be a good choice. You can preview the converted EPUB file in browser or download it directly after conversion. Information is how we learn about new and interesting things. This article is a good learning tool with a lot of fresh and interesting content. It's a great and easy tool (especially for short text) to generate quickly. The good thing is that (even if it's online) it garantees that text is not kept on any server. Thanks for your good suggestion, but our this article is focused on "ePub converter", not "ePub generator, so I may not add this tool to the list. But thank you all the same, and when writing related article, I will consider adding this tool to share with my readers.